Small businesses sometimes need legal help. They face obstacles in a range of areas, whether it’s business formation, agreements, or labor and employment. Small businesses also have a choice on how to face these challenges: they can go it alone, hire a lawyer the traditional way, sign up for an online legal service like LegalZoom, or hire a lawyer through an online marketplace like UpCounsel. 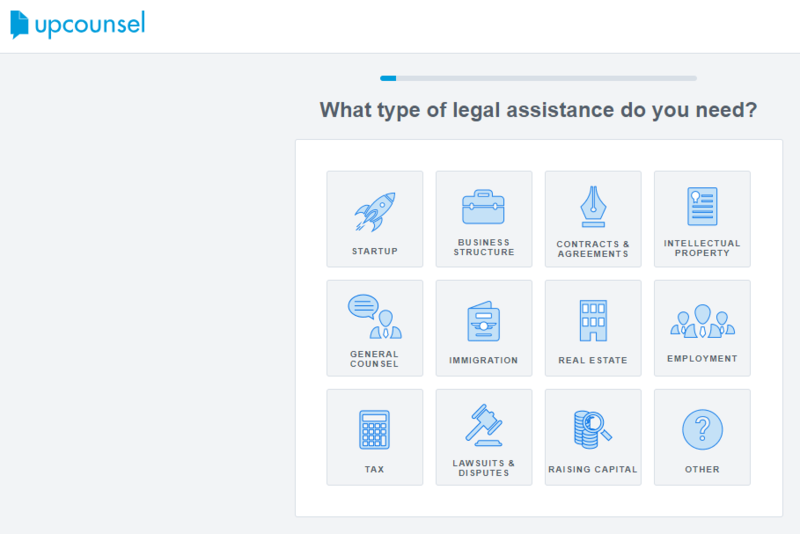 UpCounsel is purely a legal marketplace connecting customers and lawyers. With a great user experience and helpful online tools, UpCounsel offers small businesses a useful platform that does its job well. However, if you’re only interested in a full service directly from an online provider, UpCounsel may not be the choice for you. We recommend seeing what prices you can get for your job on UpCounsel and then comparing the value against what other online legal services will charge for the same work. The best online legal services usually come with a range of features. UpCounsel is unusual because it only has one feature; a marketplace. However, that marketplace gives your small business access to lawyers who can do different kinds of legal work. While other online legal services aid with trademark searches or legal document preparation and filing, UpCounsel is valuable because it allows you discounted access to traditional legal help. Thanks to thoughtful and well-designed tools, a clear layout, and a site that’s easy to navigate, the user experience on UpCounsel is respectable. Once you’ve selected the area in which you need legal assistance, UpCounsel will ask you a series of questions designed to help you get the most appropriate support for your situation. These online tools make working with your lawyer much faster by keeping a lot of the documentation online and reducing the number of tedious tasks like printing, signing, and scanning legal documents. 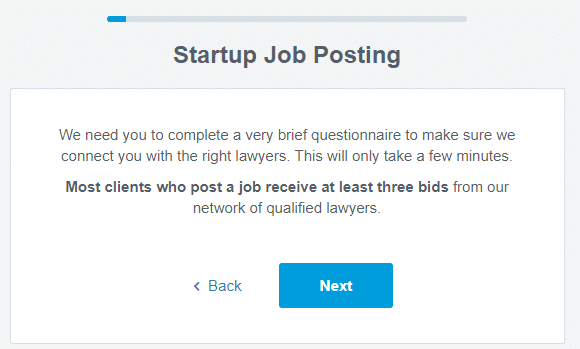 Once you’ve given UpCounsel enough information, you’ll be able to create a job posting that pre-screened lawyers will be able to bid on. Because of this system of bids, UpCounsel doesn’t guarantee specific prices for specific services, unlike rival online legal services like LegalZoom or RocketLawyer. UpCounsel claims to save their users money on legal assistance because lawyers have fewer overhead costs. 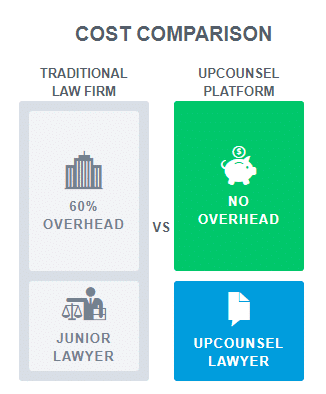 UpCounsel provides lawyers with the online legal equivalent of clerical support, meaning those legal professionals don’t have to charge as much because of the reduced overhead cost for them. This seems reasonable, and we certainly found that prices on UpCounsel were often significantly cheaper than on the open market. The bidding system is arguably an advantage to small businesses looking for legal help compared to other online legal services. This is because in a competitive market environment like UpCounsel lawyers have an incentive to offer an attractive price or risk losing the bid. Because all of the lawyers on UpCounsel have been screened, you can have confidence in the quality of your lawyer even if their work comes at an unusually competitive price. 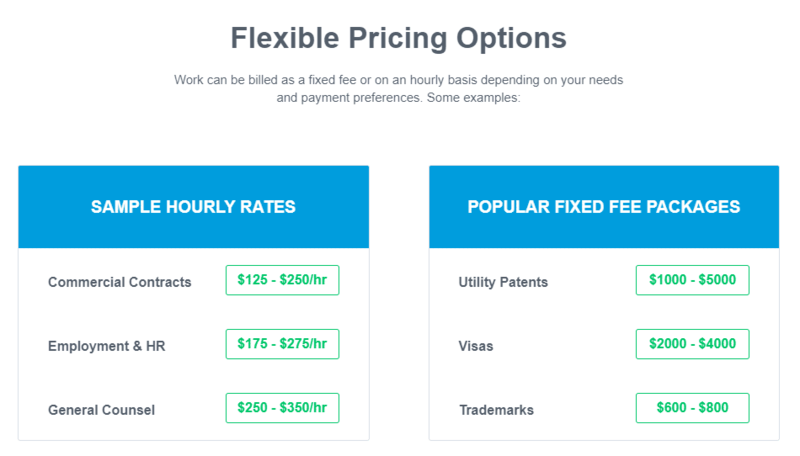 While the job-based pricing system means you can’t be sure of the final price you’ll pay until you’ve posted your job and received some bids, UpCounsel does offer sample hourly rates and fixed fee packages to give you an idea of how much you might end up paying for legal assistance. The price you pay will increase if you have more complex needs (anything requiring courtroom appearances, for example), but you will also be able to get comparatively affordable rates for more routine legal work, such as company formation. The market for online legal services is more competitive than ever, meaning there are several competing providers offering legal assistance at affordable prices. Of course, cost is only one of the factors when deciding between online legal services; remember that law is a demanding field and a good lawyer expects to be well compensated. RocketLawyer is another online legal service that offers discounted rates. However, unlike on UpCounsel where it is free to post a job, RocketLawyer is a membership site where you pay a monthly subscription to access the benefits. That said, RocketLawyer includes a lot in their membership packages. If you’d like to have the support of an entire online legal firm, LegalShield is another option to consider. They offer perhaps the most comprehensive legal assistance packages available to small businesses online at very competitive rates that scale with the size of your company. LegalZoom is also well known and has an impressive track record with small businesses. If you’re particularly interested in forming a business, be sure to check out incfile.com, who specialize in that area. UpCounsel differ from competing online legal services because they’re a platform to help you find legal assistance rather than offering it themselves. However, this offers small businesses a great way to test the market and see what is available for their money. With a great user experience and helpful online tools, UpCounsel offers small businesses a useful platform that does its job well. However, if you’re only interested in a full service directly from an online provider, UpCounsel may not be the choice for you. We recommend seeing what prices you can get for your job on UpCounsel and then comparing the value for money against what other online legal services will charge for the same work.